Please enter me! I follow via GFC and twitter! I would like to enter please,I follow via gfc. Please enter me, great giveaway!! I follow on Facebook and Twitter! My Facebook name is Gemma Stocks and my Twitter username is @JellyxEyes. Great giveaway! I would love to enter please! How fabulous! Please enter me:). I follow via GFC Saz. PS have you found that magic stretchmark stuff for me yet? I follow via GFC as Joy. Great giveaway! Thank you! I am following via GFC as Tracy K Nixon and I am a fan on Facebook (Tracy K Nixon) and a follower on Twitter too as @tracyknixon I have shared and tweeted too! (Not grumbling, but guessed you'd want to know, LOL! Following you on Facebook and Twitter. Twitter name : @MimiJane. I love Cath Kidston stuff and would love to win this! Fab giveaway! Followed you through Twitter, GFC & Hellocotton! following on twitter @comps67. love cath kidston! wonderful! following on Facebook, GFC and Pined on Piniterest. following on GFC - missmamo and on facebook. Fab prize, I <3 Cath Kidston stuff! Would love to win this lovely prize -thanks for hosting the comp! Hi, I have tried most toothpastes but never Arm and Hammer, would love to give it a go. Following on Twitter (I am @Linds_coco) and facebook, and hopefully GFC (I'm mrscocostick). Thank you for a lovely selection of delights. I love Cath Kidston she is one of my favorite designers, her prints always brings a smile to my face. I am following on Facebook (Rachie Littleme). Following on FB as Cat H Adams, on Twitter as @kilmowskicat, think I am following as Catherine Adams (Kilmowskicat) on GFC but it is playing silly beggars so can't check lol! email is kilmowskicomp@gmail.com ...I love Arm and Hammer it leaves you teeth really fresh and sparkly just like your blog! Hello! Thanks for the lovely giveaway, I am following you on Facebook as Rachael Simmons and on Twitter as @RachaelSimmons4 - thanks a lot, I love Cath Kidston! I would love to win - what a fab prize! 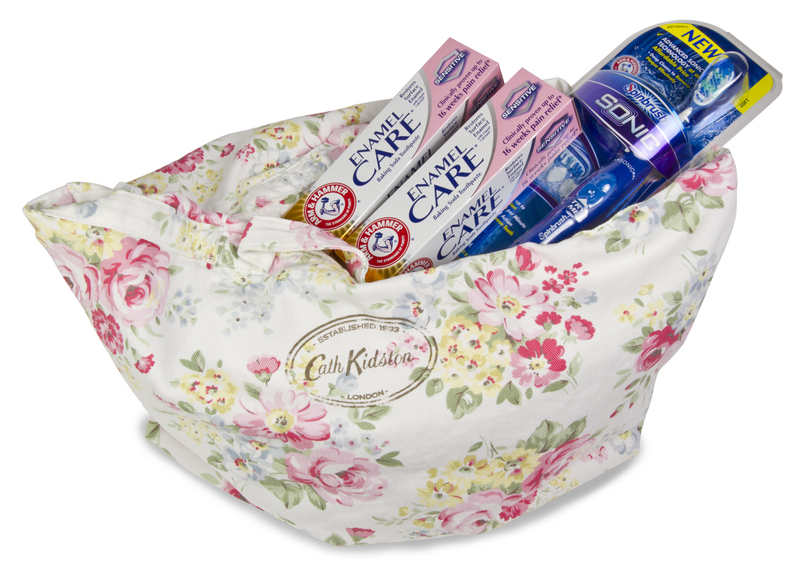 I always use products for sensitive teeth so I'd love to give this a go and I adore Cath Kidston! that bag would be perfect for my hols! I'd like to enter :) Have followed on facebook! I hae subscribed by email, I am not on twitter. Id absolutely love to win this prize :) i have liked you on Facebook! I'd like to enter, I'm following on GFC. I would like to enter please! I have followed on Google Friend Connect and you can contact me on twitter @yyesidolikecake. I'm following on GFC and FB as Maya Russell and Twitter as @maisietoo. Would love to win. I love a bit of Cath, and a bit of flutterandsparkle, therefore I would love to win. Fabulous Prize - Following on Facebook!! What a gorgeous bag! And those arm and hammer goodies would be great for my teeth, i love their toothpastes! Following via gfc, twitter and facebook. Hi, please enter me. I am following you on Twitter as @pookybearcheung. I like on Facebook "Christina Curtis"
I follow via GFC on twitter and on Facebook! Would love to win this, what a great prize! Hi, love your blog, following on FB! Following on Facebook as Chris Fliss and Twitter as @sparky61. Followin on fb as Claire Trevor. Lovely prize, I already use Arm and Hammer toothpaste, it's really good. I have liked your facebook page - I would love to win. I'd love to be entered in this, following on twitter @stresbringer also liked on facebook - Micky Ricketts, Thanks for the entry. Im following on facebook. - not sure how to use twitter! Following on GFC, would love to win this.